This is the second time I have seen and heard Yes at the City Hall in Newcastle. It�s a compact venue � where Emerson, Lake and Palmer recorded their live album, Pictures at an Exhibition, in 1971, incidentally. This was another tight performance from the band overall, though the dropping of tempos is starting to get noticeable. The sound was good and the performance powerful, however. Howe once more varied his solo guitar set, this time with an acoustic adaptation of �Hint, Hint� (from the electric album Turbulence) and �Second Initial� (from 2008�s Motif, and 1994�s Not Necessarily Acoustic). Technically, there was a hitch early in �Owner�, when the Funk, Inc. sample spluttered somehwhat. Oliver Wakeman�s keys sometimes seemed a little low in the mix from where I was seated. It was good to see Pam Bayes from the Steve Howe Appreciation Society and other Yes friends beforehand. 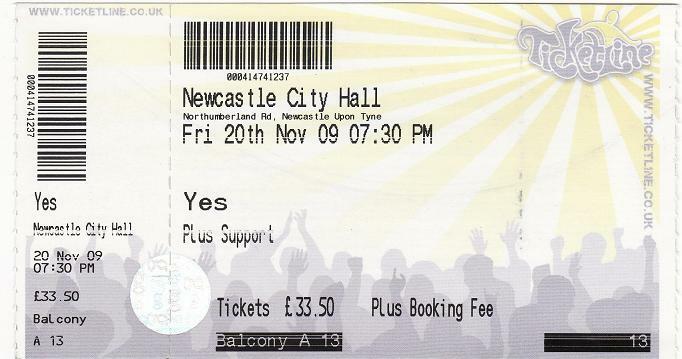 First time seeing Yes and it was a great show. Steve Howe's face just said "wow even I can't believe I'm still up here at this age playing Yes songs" haha, but he looked like he was enjoying it, as did Chris. Wakeman just looked bored most of the time to be honest, and all of his solo licks were damn near identical. Also the drummer seemed to drag the tempo around much to the dismay of Steve. Finally, the sample break of 90125 just decided to cut out on them but they recovered very well. These points aside, I really enjoyed the show, and if you closed your eyes you would have thought Jon was singing! Great stuff. wasn't far behind with 5 Basses. From up in the balcony i could see Chris' pedal board, over 18 presets and he used the bass pedals more than i ever thought he did.Sound was perfectly balanced. It was the happiest i've seen Yes on stage,everyone played with a smile on their face.Chris and Benoit danced together on South Side Of The Sky,which reminded me of Yogi Bear and Boo Boo. We got the Squire shuffle on Starship Trooper,and Alan blew his hometown crowd a kiss after his drum solo. religious experience.Comedy moment.On one of Chris' walkabouts Benoit stood in front of Chris' mike and was around 5 inches shorter,he stood there looking up at the mike. Oliver was excellent,you should have seen the pieces of paper on his keys with the different preset listings on,severe concentration was needed,all his presets and sounds cut through,he got a great reception after his introduction. Roll on 2010. Drama's 30 year anniversary,maybe the whole album should be played,how time flies or as we say..Tempus Fugit. As much as I love the voice, and stage presence of Jon Anderson, this wasn't bad at all. My seat was quite far back, but I think this helped me hear the "whole" concert. 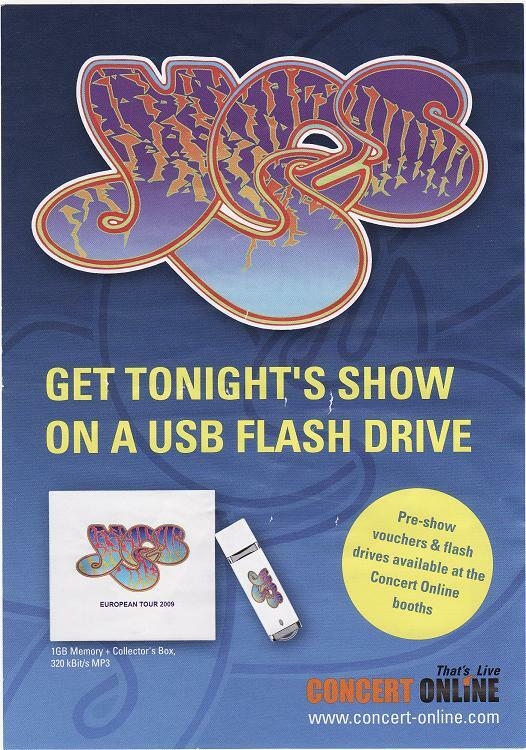 Steve Howe was more interested on this tour than I've seen him in the past. The only thing that worries me is that I've read they're thinking of making an album with the current line-up. I didn't mind them as temps, but surely a studio session should be with the classic line-up, including Jon and Rick?. What a great show and venue. The sound was spot on and the band really gave it 110%. Show started at 7:40 closing at 10:05 so unfortunately those expecting a support turned up late. It was a good set of Yes songs. Steve was on great form, have never seen him smile so much. Without the new band members there would be no show, so I am glad they are on board and giving us more Yes music. Get into the studio next year and give us another Yes album to be proud of. Just back from the Newcastle concert and have to say that it was fantastic. City Hall is quite small and after having read previous reviews was concerned that it was going to be too loud, but it was perfect. Steve appears to have found a new lease of life and was awesome. Chris' looked to be really enjoying himself and appears to have learned some new dance moves! Benoit's vocals got lost at times, but in general, he sang really well. No complaints with Oliver or Alan either, both played a great set. Only sad thing is that in a hall that holds 2000, I understand that only 1200 tickets were sold. They came, we saw, they showed us what a bunch of musicians they are. Mr David is a true replacement for jon. and as this band as always changed personel as individuals change direction in their ideas, this incarnation will stand the test of time. the set list was good, though as we would like to see our personal favorites there were some omitions. thank you gentlemen for a entertaining few hours.PS my 15 year old daughter just loves amazing guitar guy and frilly shirt guitar guy, and she has pinched the cd of the evening.